Maurice's jacket hangs in the workshop and I noticed on the floor directly underneath a build up of bat dropping. Carefully looking up into the denim garment we saw two young bats gripping the material near an armhole. 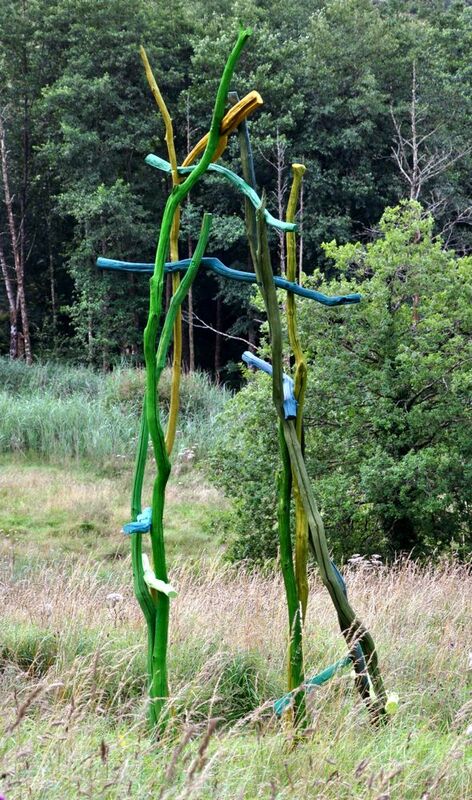 Inclination is my latest sculpture, made with painted oak limbs collected from our nearby wood. The work contains fewer pieces of timber than previous sculptures, but seems to encompass more space. 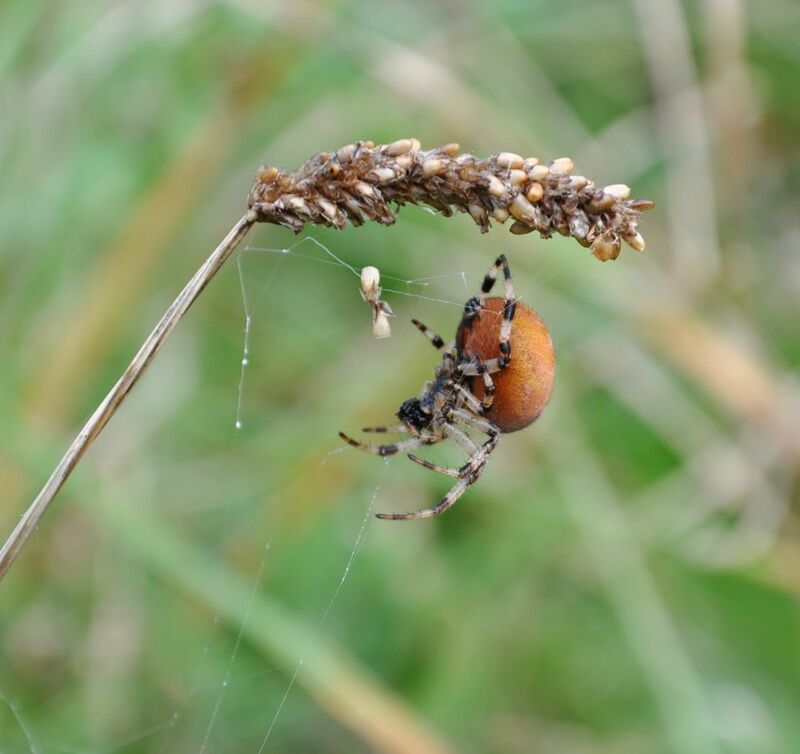 Many spiders sling their silk between separate spikelets which are to be found on rough vegetation. 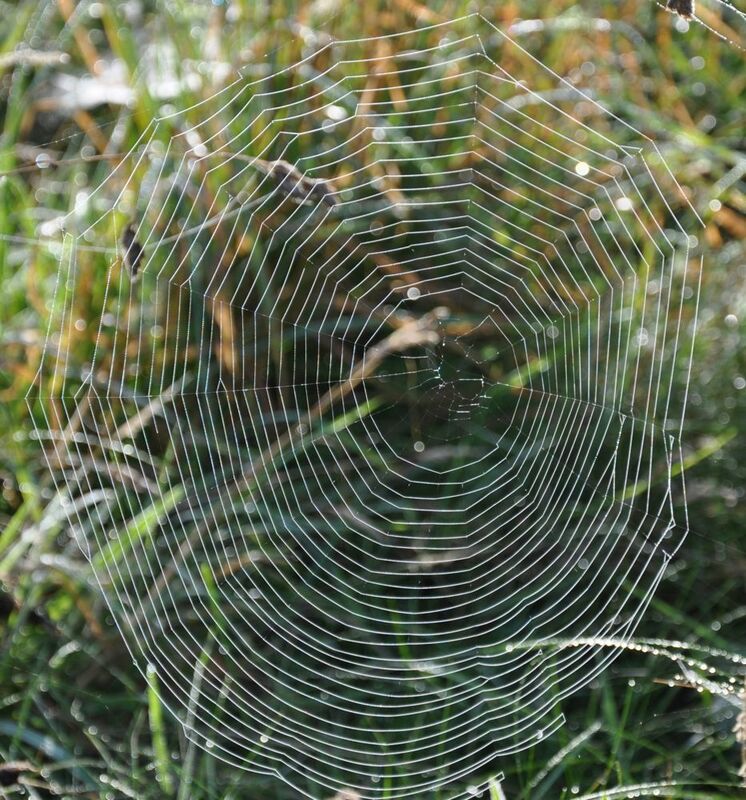 They spin delicate hammocks, veils, and spirals which remain invisible until coated by dew drops. The air has been full of moisture and mist. When ever the sun is out flying ants lift off in clouds. 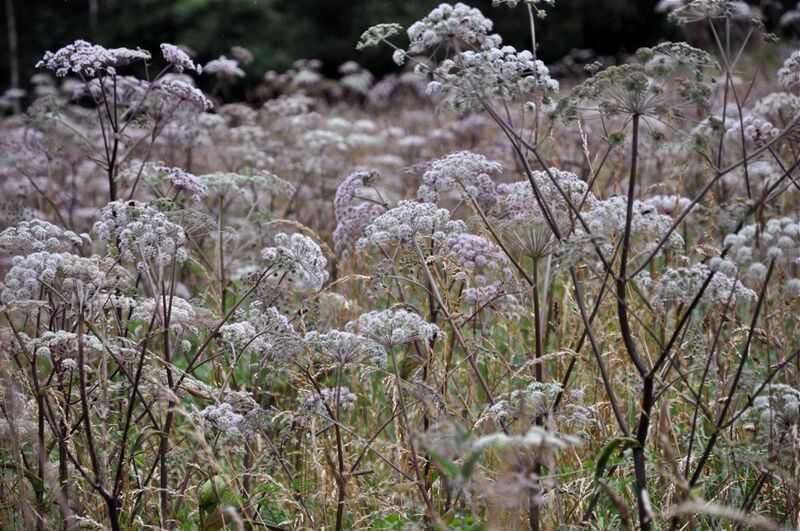 Angelica is a large plant that fills the meadows with white and pink umbrella flower heads. They have branching stems coloured deep purple. I finished building Rigout this week. 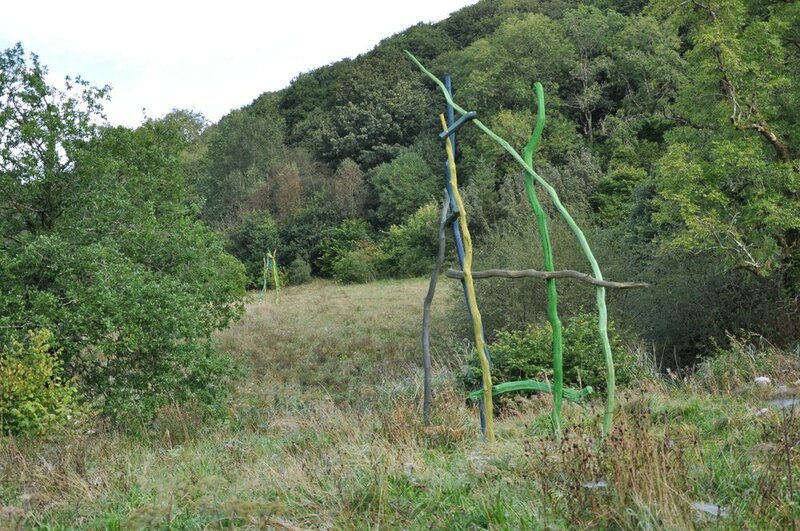 It stands in the centre of "Gwynfrudd Field", a circular, open area at the base of Coed y Foel. 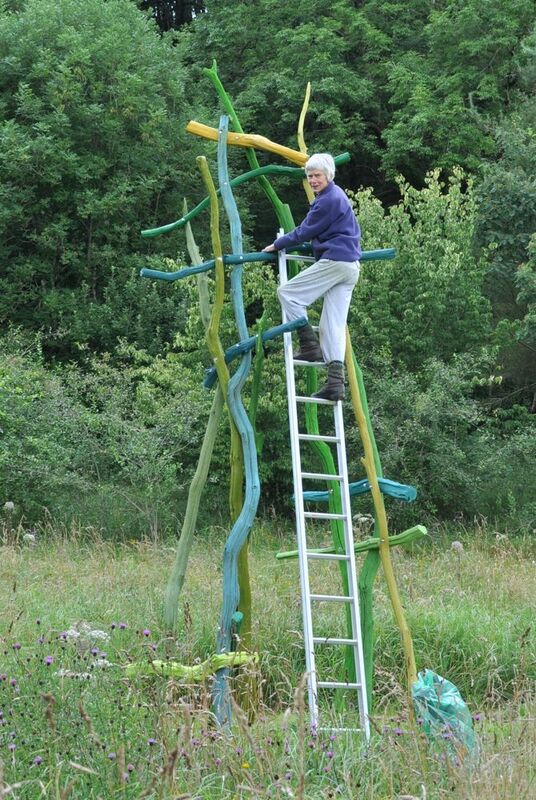 I have stained the oak limbs and the colours will alter with time and weather. 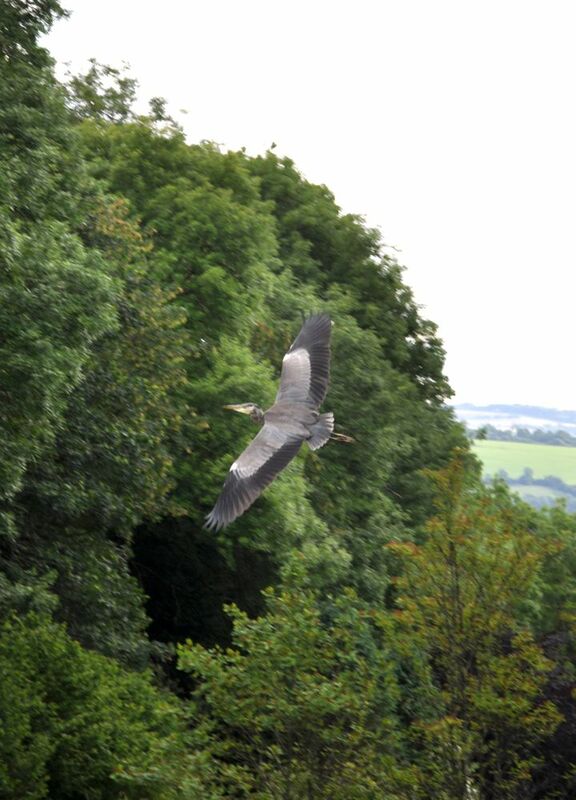 The warmth and dampness have encouraged even more growth and the Knapweed, Meadowsweet, Purple Loosestrife and Valerian have been in full bloom. 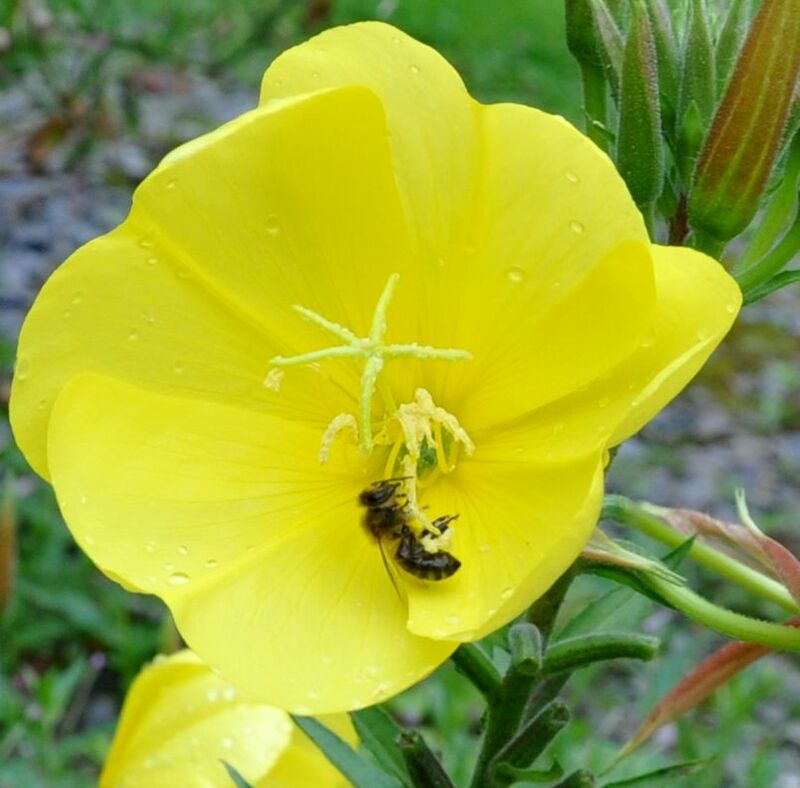 Our Evening Primroses, although not native are good providers of nectar and of course seed. 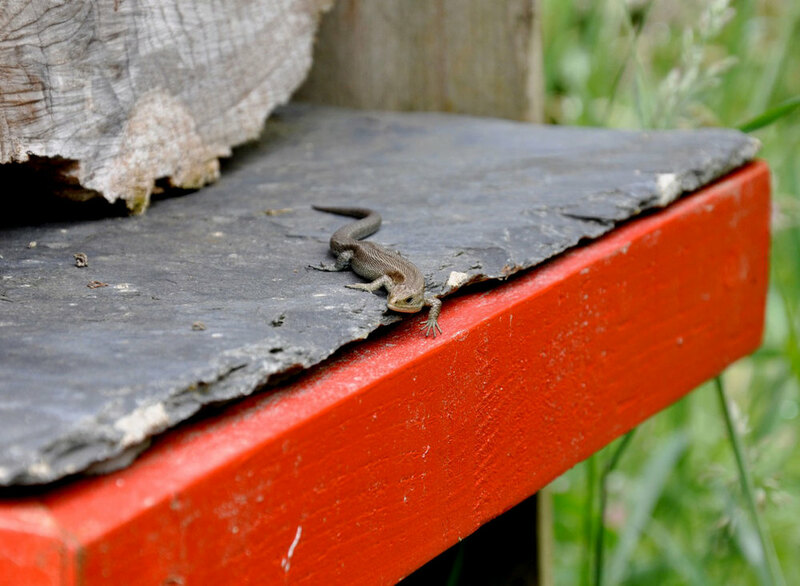 A lizard parent imposes his rights to a sunbathing position and I have nearly finished making an oak piece in Gwynfrudd Field. 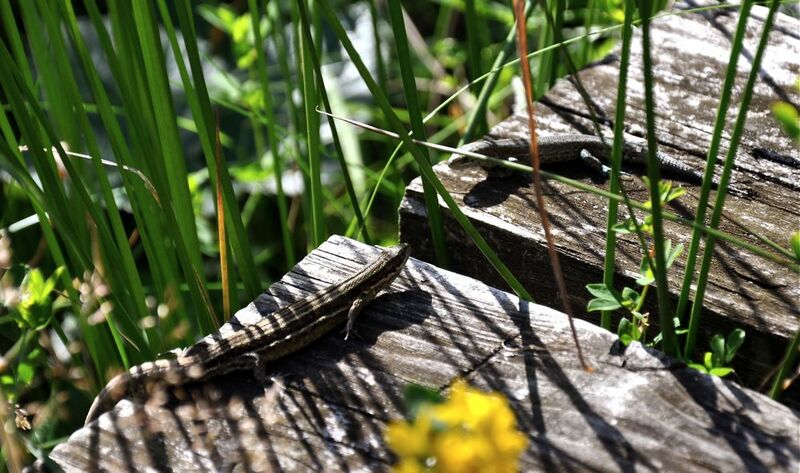 The warm wooden bench nearby the pond is a favourite basking place for common lizards. 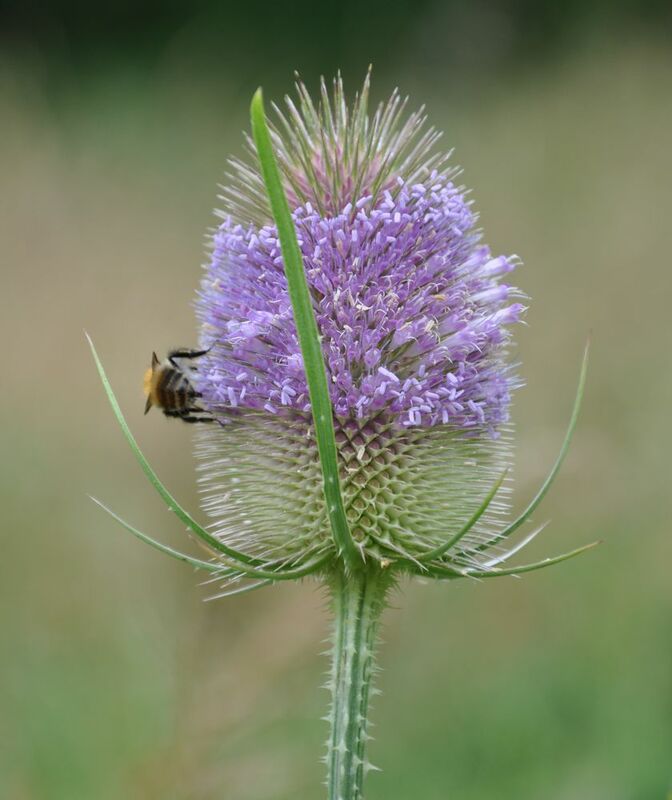 The high summer Teasles attract nectar lovers and squirrels are already eating our unripe apples. 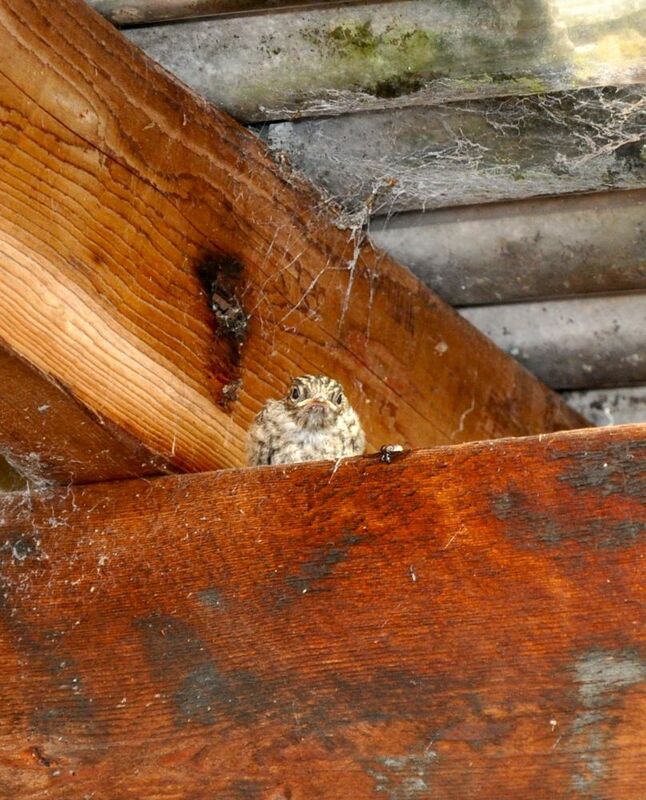 There are two pairs of Martins breeding on the house setting up a continual chatter. The evening sky during supper gives a clue to an unsettled beginning of August. Unusually this wasp nest is above ground level protected from the rain by ceramic sculpture. An enormous Kiftsgate rose rambles through a willow threatening to tumble into the back pond. Maurice's head can just be seen. Hundreds of bees and other insects vibrate the air with a loud hum. There is a dark outhouse built in stone called the Duckarama and stuck on an overhead beam is a swallow's nest built with mud. The four chicks will probably fledge today and when anything curious approaches the entrance a parent will swoop down and cry out. Maurice walking one of his pathways where the surrounding grass has grown as tall as he is. 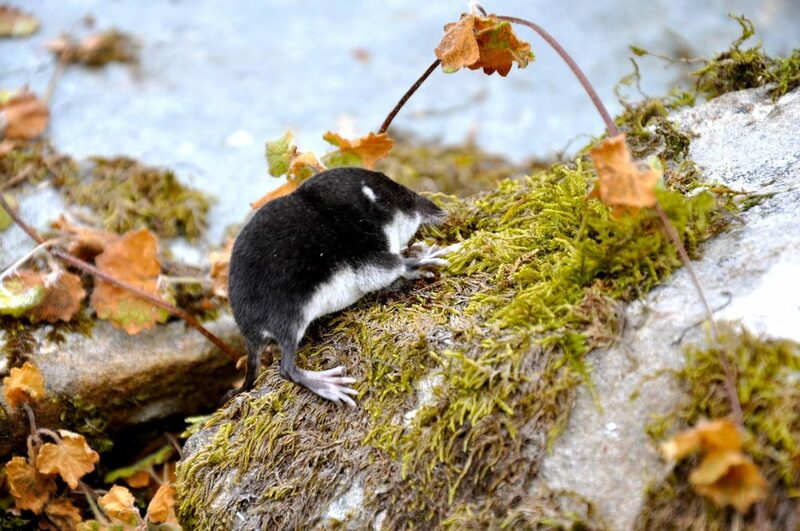 A juvenile shrew trying to find its way back home between rocks. 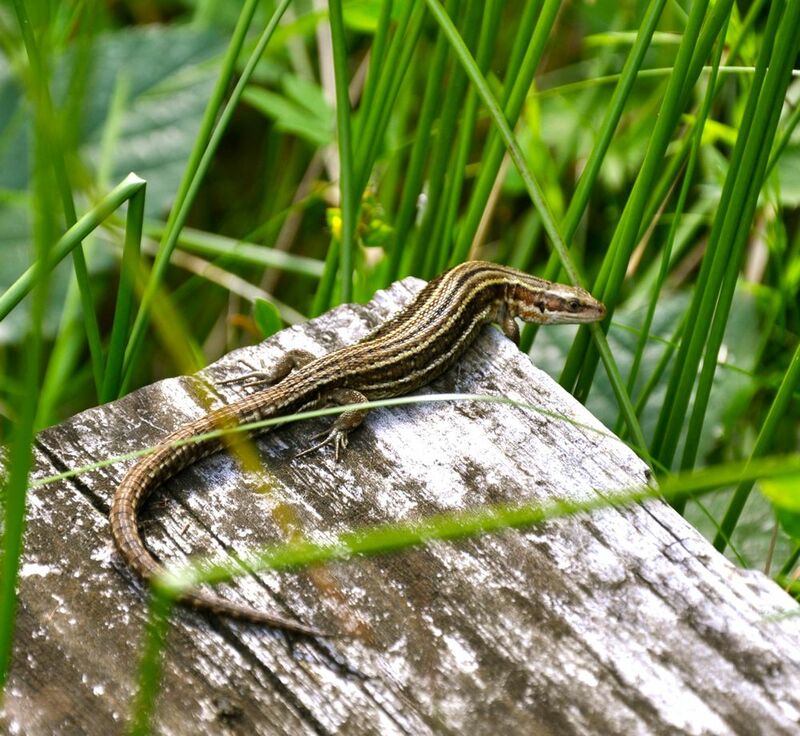 The Slow Worm at rest hidden in the long grass. The second brood this year. 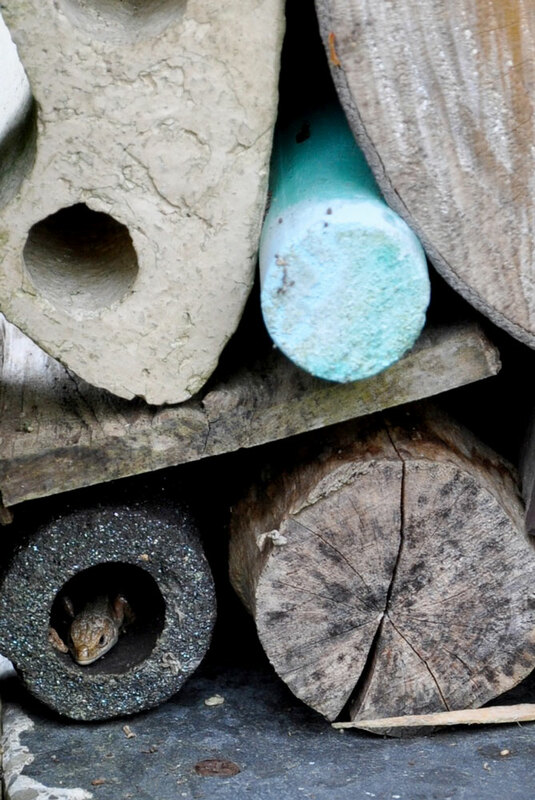 Mr and Mrs Lizard live on the lower decks of Wasp Loft inside ceramic tubes and between the logs. They appear on the slate when the sun warms it up. The day that most of the tiny toads leave the pond for a hidden life on land in the cwm. 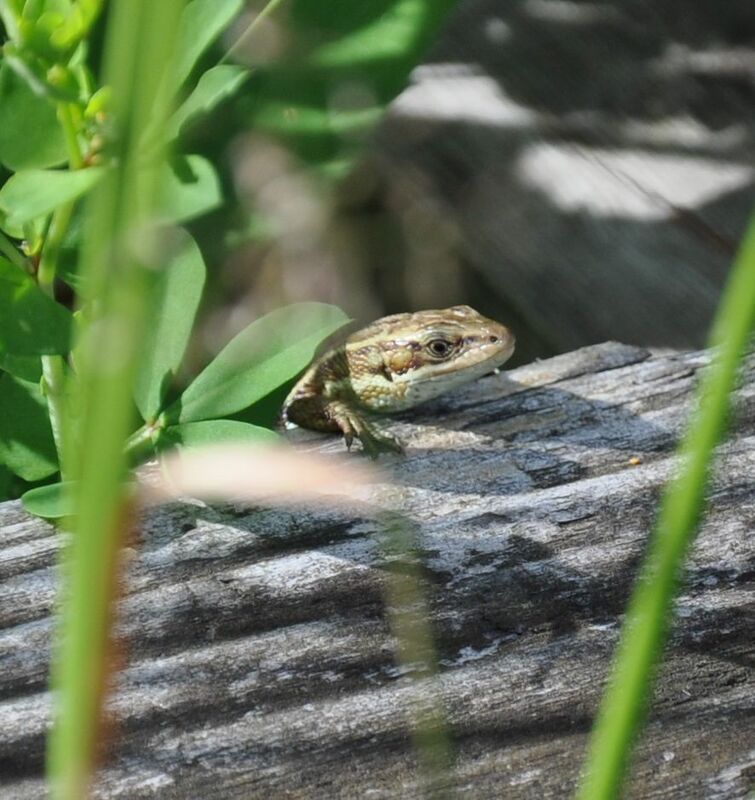 They are only 5 mm long and frantically and erratically try to walk across and through the vegetation. We try not to step on them, they are as small as flies!